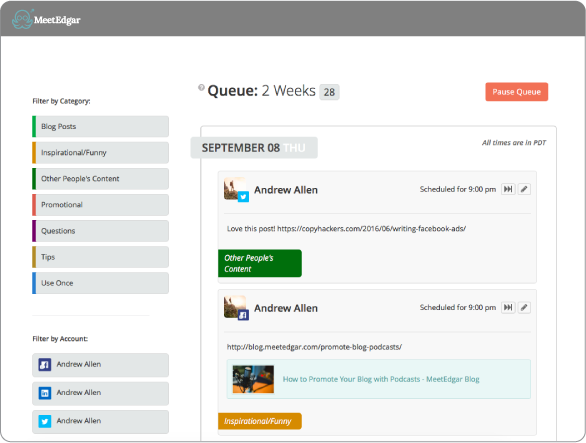 A social media scheduling tool that organizes your social media updates into a searchable library. Pros: Edgar is an amazing product provided by a company with a fun and progressive business culture. From their Octopus logo/mascot to their responsive customer service, the Edgar team makes doing business with them a pleasure. As for the product itself: if you want to use evergreen content on your social media accounts, Edgar is an excellent online database that will enable you to keep posting that content, over and over again. It's easy to set up, easy to use, easy to make adjustments to on the fly. Edgar will pull new content from your blog or website via RSS, making it easy to continually add fresh new material as well. If the price were more affordable for solopreneurs, I'd still be with them. Cons: The pricing. Basically they are gearing this product to businesses that are already capitalized to the point where it makes sense to spend per month on social media management. That's great ' if you're that size. But for solopreneurs like me who have to make every dime count, it's just not good enough of a value to justify the premium price. When other solutions like Social Pilot offer very similar features at a fraction of the cost, it's hard to justify staying with the Octopus. I would strongly encourage Laura Roeder and company to come up with a tiered pricing plan so that solopreneurs, startups and even hobbyists could take advantage of Edgar (even if a "lite" version) but at a more affordable cost. Presumably, as businesses succeed, they would move into the more robust plans, so this should be a smart long-term strategy for Edgar. Anyway, I think a business just needs to carefully evaluate the value. Bottom line: great product, but is it worth it? Ultimately I decided it wasn't. Pros: **25** social accounts is a huge number to be able to link! Forever recycling saves a huge amount of time and eliminates the need to reload once everything has been shared one time. Previews help you see exactly what your posts will look like. Unlimited number of daily/monthly posts and unlimited library. Cons: Only one price point--great if you're big but horrible if you're just starting out or have a limited budget. Only 3 networks are available--IG & Pinterest have been "coming soon" for months & YT isn't being mentioned yet. Content auto generator is horrible--it literally pulls short sections from your content and can be bad for out-of-context stuff. Overall: I loved using Edgar but the main reason I got it was for the Twitter recycling. Now that Twitter started enforcing the stupid duplicate rule, the app lost a lot of value **FOR ME**. If you an create 100 different tweets for each post, then I definitely recommend using it in conjunction with the other platforms. Pros: Create a schedule of categories to pull from. Cons: Unable to post to google+ at this time. Overall: I've been using Edgar for about a year now and I love that it keeps all my content in categories, so I can reuse as needed. It's very easy to set up and it saves me so much time in generating a schedule of content for me. I have not used customer support but I followed Laura prior to her creating Edgar so I feel confident that if I had any issues, her team would resolve them. I pay $49/month and feel that is reasonable for the service. Pros: Edgar has made it possible for us to manage our twitter accounts, Facebook pages and all of our Facebook groups within one system. Having the ability to create feeds for each of these channels and pre-schedule all of our posts has saved us a ton of time, especially during peak launch windows. Cons: It can be a bit tricky to see at a glance the upcoming posts for each channel, but overall we're very satisfied. Pros: I love that Edgar recycles old content. This is the main reason we started using Edgar - it freed up time we usually spent coming up with new posts each week. Cons: Edgar is ideal for managing one company's social media, but as an agency, we found it difficult to manage multiple clients on a single account you'd essentially have to create multiple accounts, making it more costly than competitors like Buffer. Pros: I'll start by saying I no longer use this platform but will never stop recommending it. It's 100% one of the best social tools I've ever used. The majority of our content is evergreen so works perfectly with a platform like Edgar. The initial set up can be daunting but once you have your library filled you're good to go with a constant flow of content (I thoroughly miss this aspect of the platform). The customer service at Edgar was awesome and I really appreciated how quickly they came out with new features to keep up with the ever-changing social media landscape. Cons: I ultimately closed our account because I needed an easier way to run our social media accounts at events. Edgar doesn't excel at 'real-time' tweets or engagement so I decided to go elsewhere. Pros: Easy setup and was able to add multiple social media accounts and updates through their calendar, which saved us a ton of time. This was great because I was able to manage all accounts and social updates from one window. Cons: I wouldn't mind seeing a cheaper plan in place. With so many different options out there for social management, lowering the price would allow for more smaller players to start using Edgar. Pros: It's one and done! Just add your content into the right content libraries and let Edgar do the work of posting the right content to the right place at the right time! Pros: The ability to create posts quickly and easily, add images or take posts from RSS feeds and put them into content libraries is very useful. A few simple schedules set up at the beginning means you can add a post once and then forget all about it, leaving Edgar to do the work. Cons: It can sometimes be confusing to see what's coming up or view all the schedules at once, plus the price is a little high in my opinion. Pros: It's a huge timesaver- building a library of content for social media posts and being able to schedule them based on categories is awesome. The newer additions of setting times for initial posts and expiration dates is a helpful feature as well. I've seriously saved several hours a week with Meet Edgar's automation. Cons: At the beginning, setting up your library of content is time consuming- but once you've built that library it's a big timesaver over the long term. Pros: I am huge on recycling content. Afterall, it costs time and money to produce, why not leverage continuously? Edgar helps us do that by organizing posts by category and then going through and re-posting content. I love how it helps us get more out of our content investment. Cons: Not a con for edgar, but more of a watchout for future users - Make sure you stagger your content as much as possible. You don't want to spam it and see diminishing returns too early. Pros: It has made planning social media posts a dream and being able to keep and maintain evergreen posts perfect. I love the categories, the RSS feeds and so much more. The preview mode is excellent also. Cons: No reporting, and could be better bulk editing. Nothing else really springs to mind when I think of what I do not like about it. Overall: I switched from hootsuite and never looked back. Saved time, saved money. Makes planning social media a pleasure again. Cons: Haven't found anything I didn't like yet. Pros: The ability to schedule evergreen posts with autogenerated variations for intro text. Semi-free trial. Friendly customer service. Cons: I had some issues with my 2-week free trial, in that they requested a credit card number and the amount I was to be charged in the future was incorrect (I had clicked through a promotional link, but the promotional price wasn't applied). Overall: Although I contacted customer support about the issue and they fixed it the same day, I had already found a competitor that was within the same price range with a 30-day free trial without needing a credit card and the addition of competitor analytics. Pros: I like that I can manage my Instagram account and my Facebook accounts under one interface. It has made it easier to search through my posts. Cons: The pricing. I feel there should be more price options for buying this product. Pros: I love that I can repost within the same week which greatly cuts down on amount of writing I have to do. Cons: There's nothing I don't like about this software. I prefer it compared to its competitors that are in same price range. Pros: Strongly appreciate the fact that this software will auto post for you vs having to manually post each time. Cons: Some components weren't as user-friendly as I would like them to be, but overall the software functions efficiently. Pros: It allows you to recirculate your own content and easily add new content to drive more traffic across multiple platforms. Cons: The price is too high when compared to the number of social media profiles you are allowed to setup. Pros: The best thing about Edgar is that your posts are saved in your post library to be reused later. Then you can re-use them again in the future, including setting up an automated schedule using categories to automate your posting from your library. Cons: Edgar is super pricey! You can only post to Facebook, Twitter & Linkedin - no Instagram. And you cannot manage online conversations (comments, retweets) from within Edgar. Overall: The ability to create a post once and easily reuse it again in the future. Pros: Easy to use, an abundance of useful features. Cons: Not much that I've come across yet, except for price. Pros: It's really easy to get started and figure out how to work it out. I like the tips and guidance that comes with an account, plus the outputs from it (social posts) are correctly formatted etc. Cons: It's quite pricey for what it is, but worth the money if you can afford it. It can take a while to get set up, and sometimes it's hard to figure out what's coming next. Pros: I liked that you were able to schedule a number of different topics per day, depending on how you set up your social media posts. With each post, the newer posts get sent to the bottom. Cons: Pricing could be better. It also seemed to duplicate posts at times. I wish it had a feature that would recognize duplicate posts by URL or copy. Comments: I used Edgar for a couple years and found it easy to use with multiple benefits. The only negative is we found Edgar to be falling behind with features that are already available from alternative providers. Pros: Edgar is definitely the best social media scheduling tool with the ability to recycle the posts on different social media platforms. Cons: The platform is a little buggy and keeps disconnecting from profiles. I suppose it is more to do with the platforms than Edgar. Pros: Great at posting content across various social media channels. One stop shop for social media content curating. Cons: For the price I would want more features and less limitations. Overall: Great! Gets the job done and it's a one stop shop for all your social media channels. Comments: Just an excellent piece of software. It has helped me schedule our social media posts really efficiently. Pros: It's easy and simple to use, well designed and aesthetically-pleasing. No "feature bloat". It saves me tons of time. Cons: I would love the ability to tag pages in posts, emoji support in the textbox, and for Edgar to work on Instagram.